superb skin. it's the skin of choice for me now. Been using it for a while, and it's a pure pleasure! That is amazing work. Thanks for this skin. Good god this is fantastic!! I found the perfect color combo, went looking at the rest of 'em and now I can't find the 'perfect' one anymore LOL. Wonderful work. Absolutely freakin fantabulous. The coolest flippin skin I've ever seen. Color combos are unreal, both in quality and quantity... LOVE the boba fett color scheme... This skin ROCKS!!!!!!!!! ...Really DAMN good skin...A KEEPER!!! Thought it was impossible, but this skin is much better than 883_enkera, exspecialy the minimalised mode !!!!! Wow...just wow. Too bad this wasn't entered in the GUI Olympics or somesuch similar competition. This is easily the most appealing winamp skin i've ever seen. 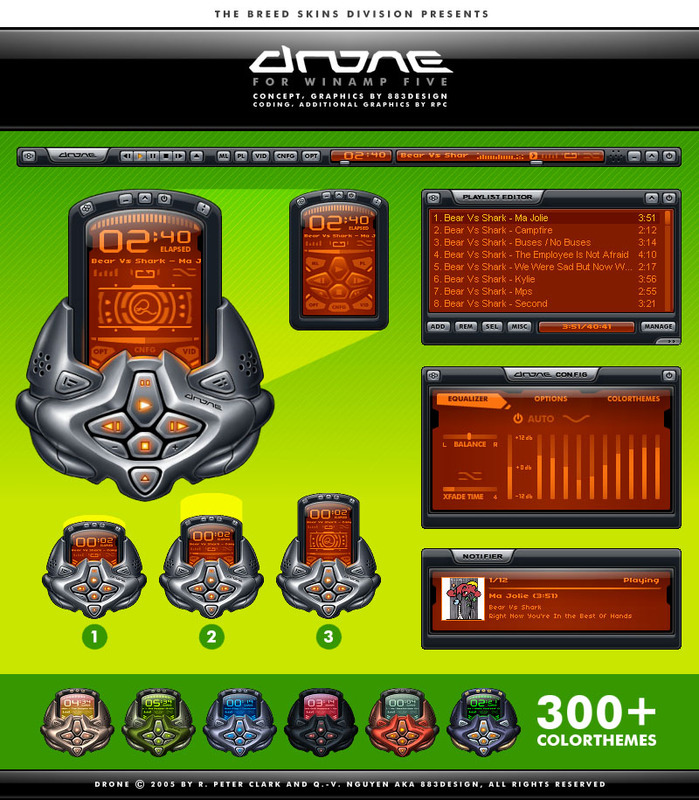 I loved you last winamp skin. i have told a lot of people about were to get it. It's been a while since Enkera, but this.... It's sure is an awesome skin you made! Love it, as much as I love Enkera - still! Ah - something to allow me to give d-reliction a rest. Exceptional and jealousy-insiring quality and style. WOW! This skin is the best skin I ever had. I like it cause it has many color themes, and that makes this skin perfect for anybody. I also like the windowshade mode, it's very practical.